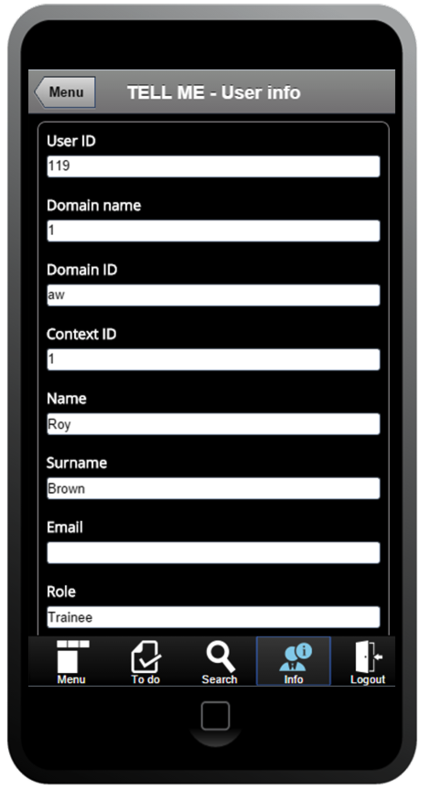 A: The whole mobile TELL ME UI has been developed from scratch with Dojo Mobile. 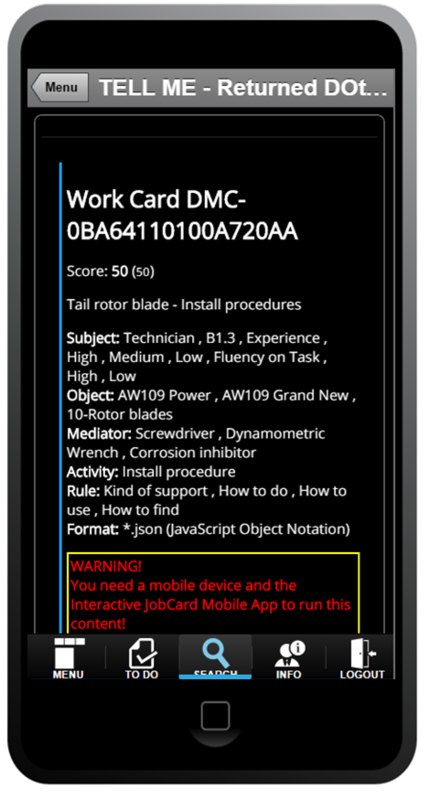 The application (with Dojo core “has” module) “sniffes” the features of the device and forward to the desktop or mobile UI. 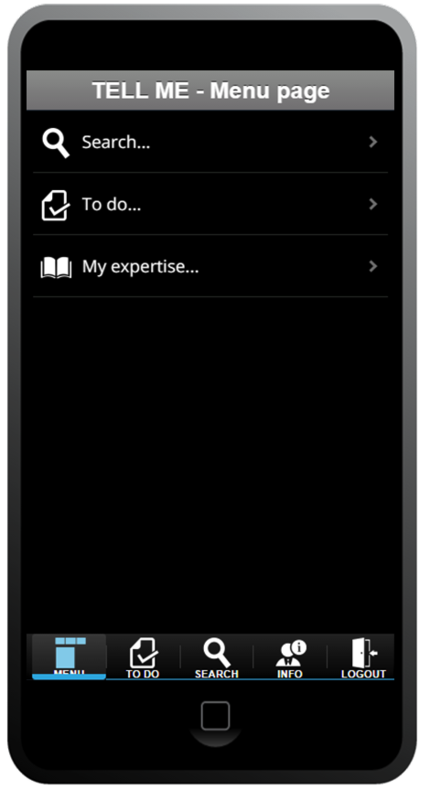 The trainee/blue collar worker can then login and access the main page where several options are provided as a rounded list (“Search”, “To do”, “Expertise”) and a useful bottom navigation menu is included. The “Search” functionality in particular allows to browse a domain-related taxonomy where tags can be selected to launch searches on a remote Apache Lucene indexing server and retrieve a list of learning contents to consume, by launching native applications on the device. 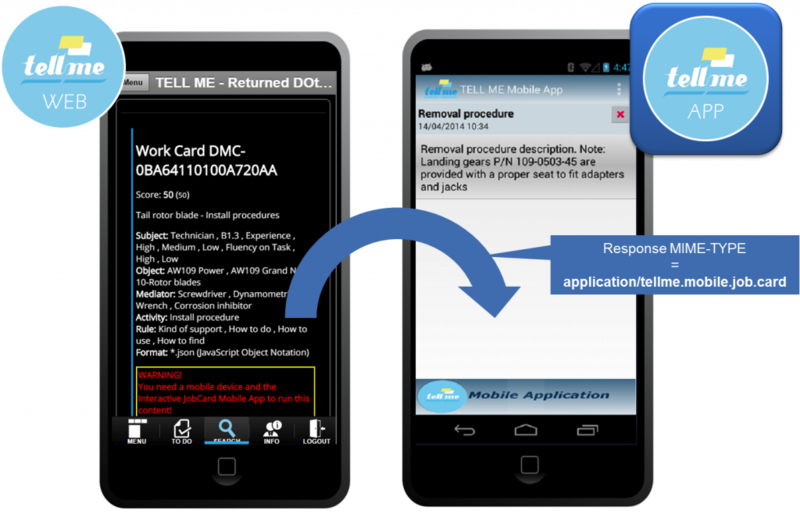 If the returned learning content has a specific proprietary MIME-TYPE, a dedicated Android app is automatically launched on selection, allowing the trainee to follow a step-by-step job card in a multimodal way (Text-to-Speech plus Speech Recognition features). A: Also Dojo Mobile generally confirmed the initial expectations: the good impression it gave at a first glance was confirmed by the technical results achieved by the prototype, which was developed without particular problems. Dojo Mobile required a short period of training but, after the experience with the base framework, the learning curve was not steep at all and the examples provided in the tutorials helped a lot in setting up working prototypes in a few days. We implemented a navigation tree to allow selecting the tags to launch the search and we will work in the next period on optimizing both usability and layout. A: After a first technical evaluation phase, where end-users tested the developed applications, we collected useful feedback to work on in the next months. In particular, we would like to make the desktop UI more responsive, and we are likely to start from a fully responsive framework (e.g. Bootstrap) to revamp the presentation layer while keeping Dojo modules and back-end services unaltered. The templating mechanism still have to be completely understood and evaluated, and surely represent a direction to follow for further developments. The prototype will be extended to include the complete logging of all learning experiences by mean of a dedicated Dojo-based logic connecting the UI to a Learning Record Store (LRS) as specified by the ADL specifications for the Experience API. Furthermore, as the TELL ME project addresses also the use of advanced Human-Computer Interfaces (HCI), the Dojo-based UI will be ported as the HTML layer for an Augmented Reality (AR) application developed on the Unity 3D engine. We moved to Dojo 1.10, but we are definitively eager to start playing with Dojo 2.0 as soon as possible! TELL ME (Technology-Enhanced Learning Livinglab for Manufacturing Environments) is a research project co-funded by the European Commission to improve training in small and medium-sized manufacturing environments by using the latest technologies and insights. The aim is to bring innovative learning methods to manufacturers so they can better supply the needs of their markets, which include larger industries. TELL ME is a three-year project that started in November 2012 with a partnership of 14 leading organisations in academic research, technology and industry from Italy, the UK, Finland, Sweden, France, Germany, Spain and Portugal. It is a significant €8.3m R&D project, funded by the Consortium Partners and a €5.9m research grant from the European Commission under its FP7 Framework Programme. Thanks Stefano for telling us about your experience with Dojo. If you would like to share your experience with Dojo, please contact us.